Discover 10 steps to create your marketplace, validate your concept and get an initial user base. Due to the advancement of technology, marketplace is brought online and quickly becomes a popular trend. The success of platforms like Airbnb, Etsy and Fiverr has already proven that the marketplace model is very scalable and can be applied to pretty much any part of online business. In fact, marketplace business model is booming like never before where marketplaces are performing better over other business models. And this is the best time for you to become an online marketplace owner. Certainly, creating your marketplace is a real step not only at the professional level but also in your personal life. But while creating your marketplace, keep in mind that your marketplace will become successful only when you put some extra effort to make it a successful one. If you consider the "marketplace" as an adventure at the beginning of a great project, some points are essential to maximize your chances of success. Here are 10 points for you to take when creating your marketplace. Follow the points step by step and have a real feeling of being a successful marketplace entrepreneur. It's a bit like the 2.0 version of the business plan. Definitely marketplace businesses are long-term initiatives. To create a sustainable and successful marketplace, you need to find a marketplace business model that will finance its operations. Your marketplace business model is on one page. If you look at the Airbnb business model, you will see it is unique, profitable, and has evolved to such a level that the brand is now the world’s most loved hospitality brand. And again, the success of Etsy goes to its unique business model. Unlike eBay or Amazon, Etsy chose a narrow domain of art, craft, handicraft and handmade items. The Etsy business model is also exceptional as Etsy provides an amazing value to both buyers and sellers. 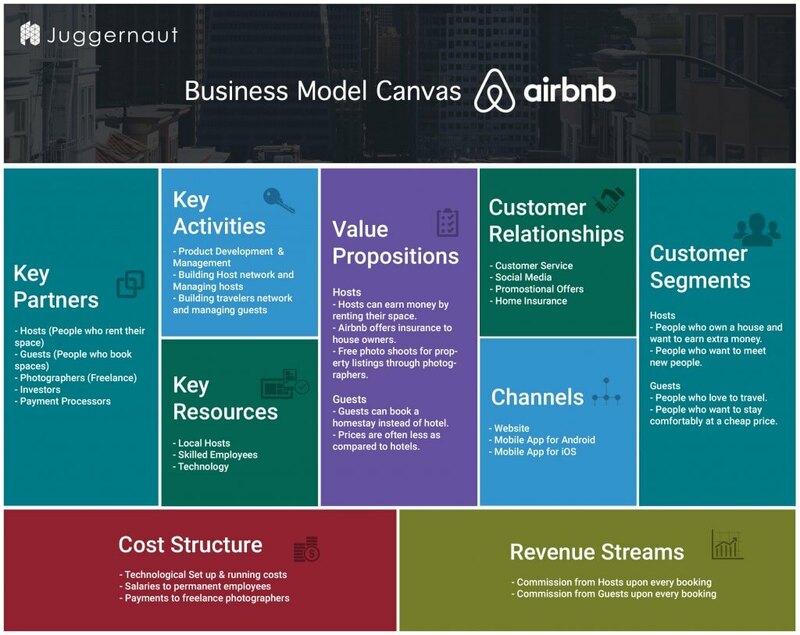 And do you know the most common and widespread tool for developing and visualizing a business model is the Business Model Canvas? 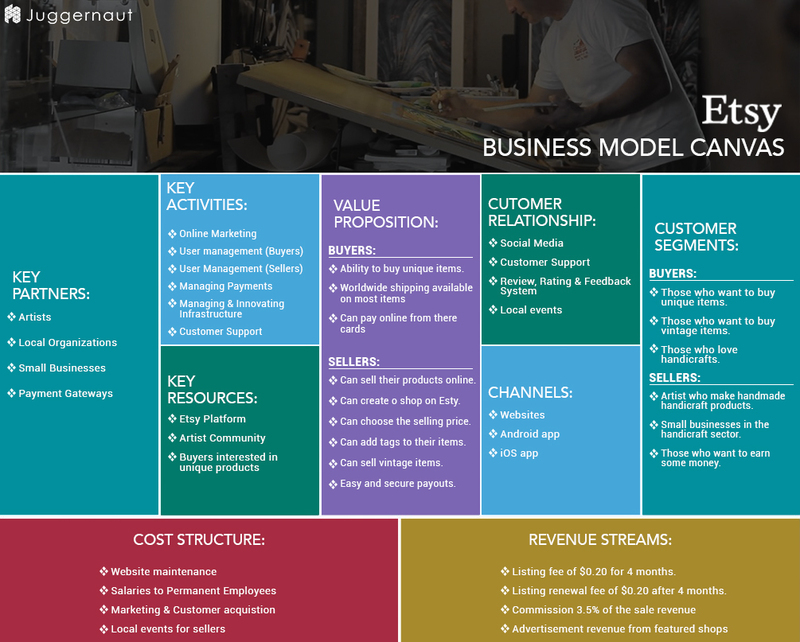 You can use the canvas to describe, design, challenge, and pivot your business model. You can build a Business Model Canvas when starting a business to know exactly where you are going. It's time to put the initial goals of the marketplace, first, in the short and then in the long term. You may already be thinking about the target audience, but also the added value of the marketplace. The costs are to be taken into consideration as well as the economic objectives. Logo is called the signature of your brand. Create your logo by a professional. If you do so, it will be the assurance of having a logo that will perfectly match the image you want for your site. Several options are available to you, but count between 150 to 1500 Euros for a designer to make a quality logo. You can find some cheaper alternatives on sites such as Fiverr.com or Codeur.com, for example. Several freelancers will make proposals starting from $ 5 on Fiverr.com or according to your financial means on Codeur.com. While hiring a designer, one important thing you have to keep in mind: always be sure to analyze the comments of the former clients of the designer you choose to create your logo. And create your own logo online. For this, many online logo generation solutions exist. It is a very complete solution to start your project. A dashboard is available to manage your site and control all transactions and other statistics on your site. Kreezalid provides you with unique marketplace features. Here are some of them. Taking care of hosting your marketplace, no need to worry! An HTTPS connection is set up for each payment, as on all serious online stores. In order to publish ads that are well referenced by search engines, and to be among the top rated sites by Google, you can control the SEO settings of your ads and your content pages. While yours one is an asset sales marketplace, you can manage the shipping options, shipping costs and times. Kreezalid also offers a blog area where you can reach your customers, marketplace community in your own way. Everything is set up to facilitate the creation of your marketplace. To learn more about Kreezalid and start your free trial, just click here. You can start the dynamics of your marketplace by creating your first marketplace listings or inviting your family members, friends, etc who are your marketplace community to create their first listings on your platform. Keep in mind, your listings should be structured in a way that will make it easy for search engines to crawl your marketplace. You can manage your listings using a form that you can customize upstream with the criteria specific to the area of activity of your marketplace. Once the form is right for you, it's easy for your suppliers to submit their first listings. To set a good example, be the first to post an offer. You can among others, insert the description of the product, the price, several photos or the location. It is only YOU who decides on the layout of the marketplace listings and the information they contain. When your first sellers post their offers, you'll be able to act as a moderator and edit listings before or after they're published. You can create a free professional Facebook page. If you already have a personal page, you know that it works with friend requests. In terms of a page, there is a real difference: the likes. Everyone can see what you post and people who "like" see the news of your marketplace on their newsfeed, if you post regularly on Facebook. The ideal part of a marketplace is to create a public page so that the page is accessible to everyone. Start your network by sharing your page with their friends, who may, in turn, invite their friends. It's the beginning of a marketplace community. You can also read our great article ‘Use Facebook to give visibility to your marketplace’ to learn more about your perfect management of Facebook to make the best use of your marketplace community. Now join Facebook groups related to the activity of your marketplace. The advantage with Facebook is that almost everyone is accessible. By joining thematic Facebook groups, you can talk with people who have the same interests as you, or who will be interested in what you offer in your marketplace. Here you will enjoy free advertising that are accessible to or seen by many people. Bet on active and specialized groups to be visible effectively. Some groups are openly dedicated to selling products. In that case, take the opportunity to promote some of the offers on your marketplace and sell on Facebook. Remember, your blog is like a user guide for your marketplace, but more personal. Customers like to know the beginnings of a project. Explain to them why your project is unique and make your marketplace an attractive one that it should be! If you offer your advice and explain everything up to scratch, there are chances to know about your platform and readers will be regular to your marketplace as well as customers too. You can propose to them a known blog to write an article where you will speak about the concept that you propose on your marketplace. In addition to helping you referencing your site, this will make you aware of the already existing blog readers. More exchanges = More likes = More potential customers! Then try to familiarize yourself with some growth hacking techniques for your marketplace growth. For example, try to find emails on Facebook or Linkedin to create a first email list. Once you are familiar with social networks, you can sometimes access the email addresses of people in your circles. You will start to create a base of potential customers to whom you can send your first marketing emails or newsletter. The big advantage of creating your own list is that it is well targeted and will play an important role in your marketplace growth. Some agencies that offer email campaigns sell lots of email addresses but are not necessarily those of the target of your marketplace growth. You can start creating your own potential customer listing yourself, all for free. It’s effective when it is well done; the newsletter puts your marketplace directly in the mailbox of your potential customers (sellers or buyers). And for this to work, studies have shown that you have to rely on a segmented newsletter. You put your email addresses in groups according to their interests, age, gender or other, and then you choose to send a targeted advertising. However, if the newsletter is well organized and its target is well studied, then there is no risk of being wrong. You can aim just right and propose to your customers what they are looking for or even better, and create the need accordingly. By following these 10 tips, you make your marketplace flourish. Now your marketplace should already take a shape and its first communication campaigns too. If you put everything in place, with a little time and work, your marketplace will stand out from the others and ensure you a great success.